Shearing sheep has to be one of the hardest farm tasks. It can be enjoyable but it is always hard work. For ten years, my husband and I tackled the job ourselves. We would spend multiple weekends shearing sheep and fiber goats. The results got better as we learned how to shear a sheep, and became more skilled. But the time commitment was enormous, and during both seasons, there is so much other work to be tended to also. It was accepted as a way of life but, it was definitely taking its toll on our bodies and lives. 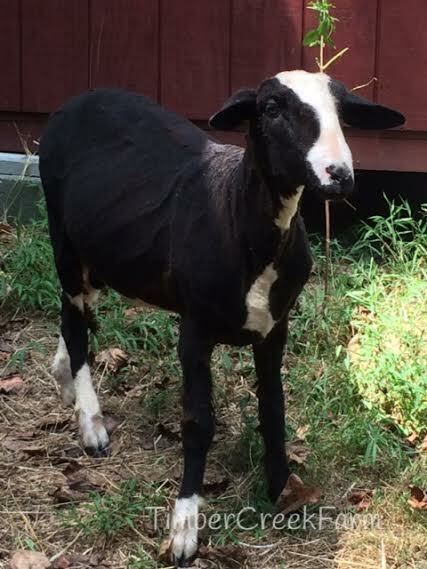 As our flock grew and included more sheep, out of curiosity, I called a professional sheep shearer. I was very happy with the quoted price and even better, she was acquainted with the breed of fiber goats we raised and knew how to shear the Pygoras. For the last few years we have used professional sheep shearers to shear our flock. The job, that used to take multiple weekends, is now completed in just a few hours. 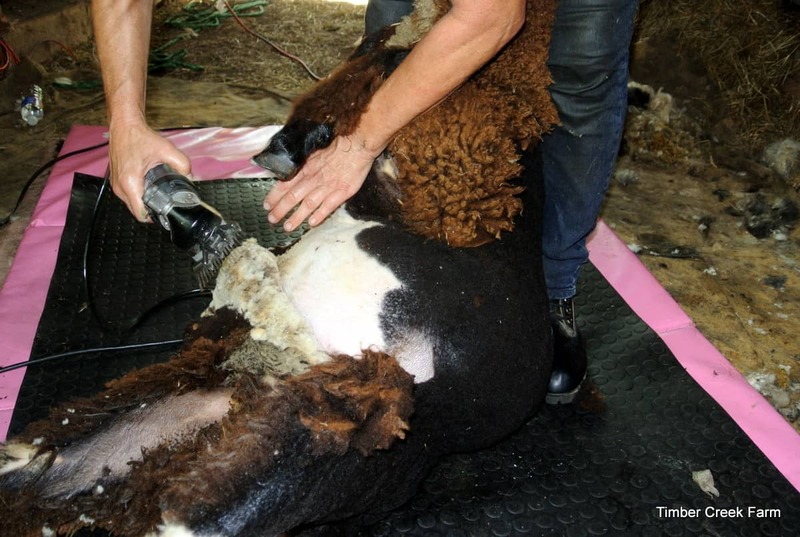 I know not everyone can spare the money to have the animals professionally sheared. But if you can save or reserve the funds for this, I recommend it. As shearing day approaches we start to prepare the area for shearing. Our barn, like our home, doesn’t always stay neat and clean. Clearing the barn isle of hay and equipment, gives us a place to shear if the weather is very hot or rainy. We also prepare an outdoor area, near where the sheep are housed. 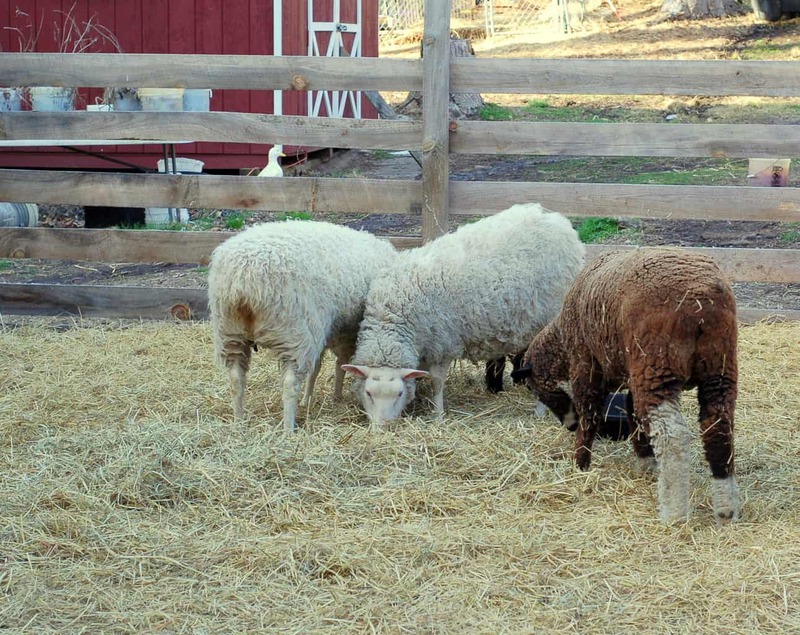 It is easier on the animal if they do not have a full rumen while being sheared. I do let mine have some hay to munch on overnight but we do not feed anything the day of shearing. Collect the animals in a small sheltered pen where they are accessible and out of any rain/wet weather. It takes up a lot of time if you have to collect animals from far pastures. Have a lead rope ready if your animals are reluctant to be caught and removed from the herd. I have two that walk right out and let us start work on them without issue. But most of ours need to be cornered and led by a rope, with someone behind them, providing encouragement! We don’t show our sheep and goats and they never leave the farm. I know that some animals are more used to being led around and it is an easier job. Have the electric on and the extension cords ready. If the day will be sunny, choose a shaded location or possibly work in the barn if there is enough room. 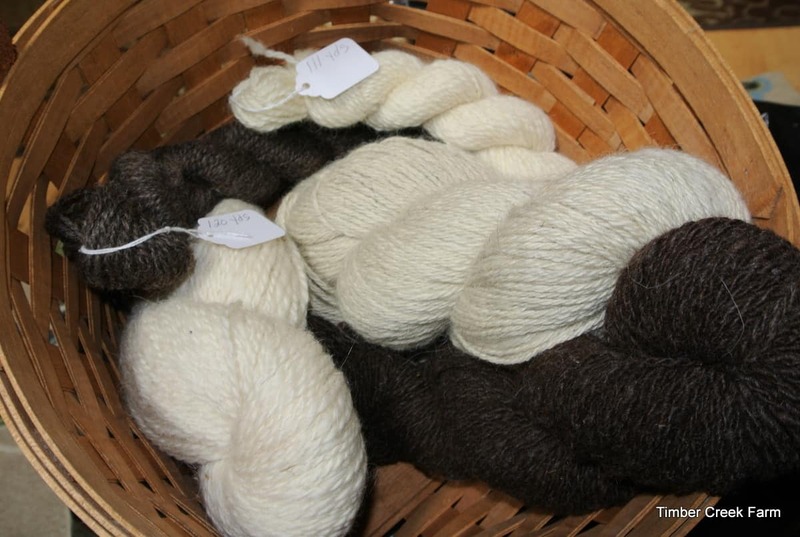 Gather your bags or boxes for collecting the wool. I don’t have time for much skirting while the shearing is going on. If I see a patch that is definitely too felted or soiled to be of use, I will discard that immediately. Otherwise most of the wool goes in the bag for later skirting. The blades should be clean, disinfected and in good working order. If your animals have tested positive for CL or any infectious diseases, let the shearer know so they can take extra precautions when cleaning up after working with your herd. Foot rot or scald is contagious so definitely point this out if you have any animal suffering from it. Try to work in the shade, and watch the animal carefully for signs of tongues hanging out signaling heat stress. Also, watch the respiration and stop immediately if the animal shows signs of heat stress. Your shearer may want to reschedule the appointment if conditions are extreme. Have water available to keep hydrated while shearing sheep. Know where any lumps, skin issues, or wattles, are on your animal and alert the shearer to these areas. 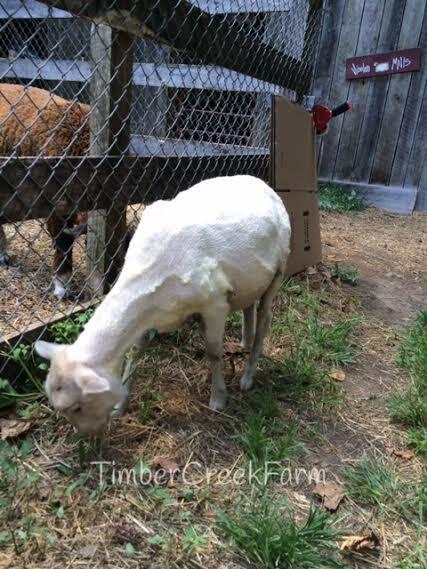 A few of our fiber goats have wattles in odd places. We have the shearer trim hooves while shearing sheep. Its a great time to get this job done. On the other hand, we do not recommend that you use this time for dosing worming pastes or liquids, vaccines or other medications. 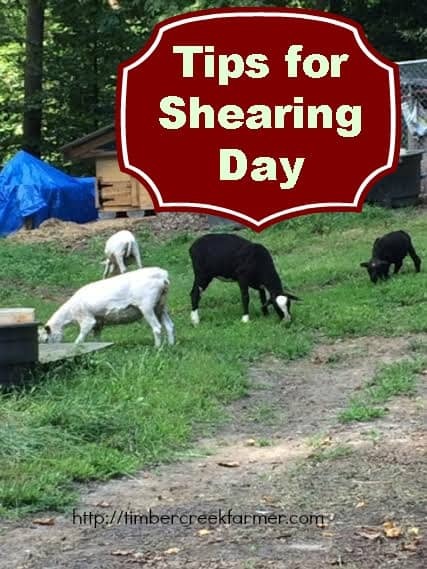 Shearing day is stressful enough and adding in medications is contraindicated. I have talked with other sheep owners who do not like to have the feet trimmed during shearing. It can possibly leave blood drops on a clean fleece if the hoof is nicked during trimming. Also the bits of hoof can get stuck in the good fleece. This is a decision you and your shearer need to make. 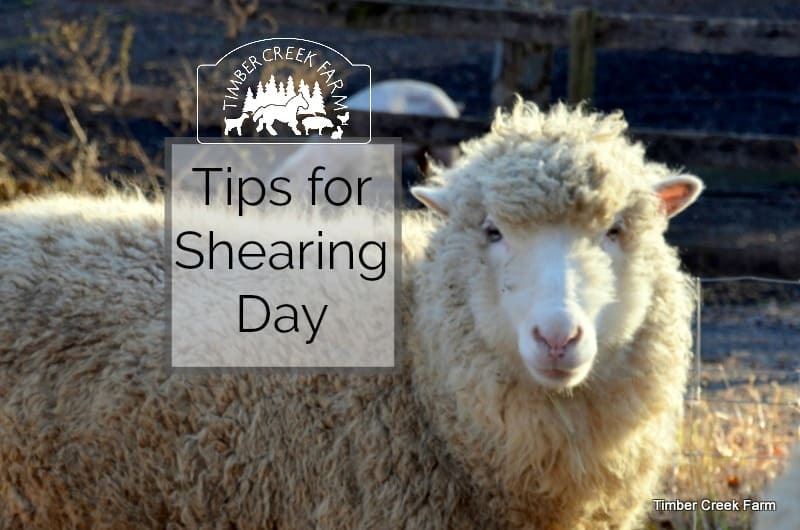 Keep other distractions such as dogs, children, other animals away from the shearing area. I think that it’s wonderful to share farm happenings with friends and family. Letting people visit can be very educational. My advice would be to have a good plan in place. Remind people observing that the sheep need to stay calm. Everyone needs to stay out of the way so the shearer can do her work shearing sheep. Request that pets be left home on shearing day. It might be a good idea to check with your shearer before issuing any invitations. Shearing season can be very stressful. The shearers are in high demand and have many farms to visit. We know how to shear and have the equipment that we were able to afford. But professional equipment makes the job go much faster. For the size flock we have, it would not be cost effective to purchase that grade of shearers. This is a video of one of our pygora goats being sheared. This method used is less stressful for the goat because it’s fast and they can’t struggle. Micah was chosen to be the featured goat in the video. It took less than seven minutes for Anne to have Micah looking clean and handsome. Please visit our handmade shop on this site to see all of our yarns and other handmade products. Hiring a sheep shearer is worth the cost! It does save so much time, and I thinks so much easier on the flock. That seems like a lot of work, but I see the fruit is certainly in your labor. It is a lot of work Deborah but the fiber and wool are so beautiful Thanks for stopping by! We only have a handful of sheep, but we hire someone to shear them because it is much cheaper than buying decent equipment. 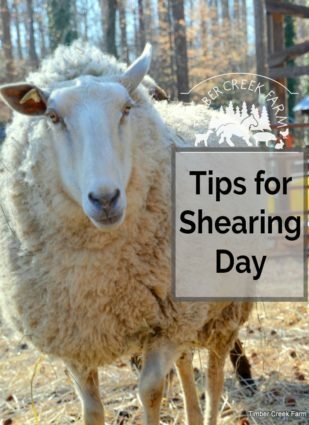 Great tips for preparing for shearing! Thank you!